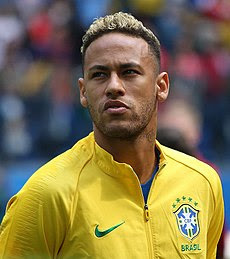 Neymar da Silva Santos Júnior " Neymar Jr "
Neymar da Silva Santos Júnior “ Brazilian Portuguese “ was born 5 February 1992, commonly known as Neymar Jr. or simply Neymar, is a Brazilian professional footballer who plays as a forward for French club Paris Saint-Germain and the Brazil national team. He is considered to be one of the best players in the world. 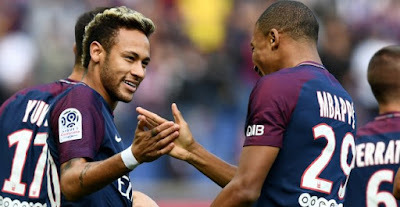 Neymar began playing football at an early age and he was soon spotted by Santos FC who offered him a contract in 2003, where he was inducted into their youth academy, which has, in the past, produced Brazilian internationals like Coutinho, Clodoaldo, Diego, Elano and Alex. He also joined the likes of Pepe, Pelé and Robinho in starting out his career at the club, nicknamed Peixe. While in the youth academy, Neymar met Paulo Henrique Ganso, becoming good friends in the process. Aged 14, Neymar travelled to Spain to join the Real Madrid youth team, at the time when Real had stars like Ronaldo, Zinedine Zidane, David Beckham, Roberto Carlos and Robinho.